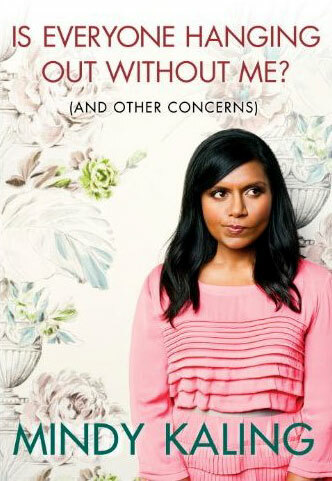 Mindy Kaling’s forthcoming book, Is Everyone Hanging Out Without Me?, won’t actually be released until November, but why let a little thing like that get in the way of a good swoon? To quote the official publisher’s blurb: “Mindy shares her observations, fears, and opinions about a wide-ranging list of the topics she thinks about the most… from her favorite types of guys (including Sherlock Holmes, NBA players, Aaron Sorkin characters, and 19th-century fictional hunks) to life in The Office writers’ room to her leisure pursuit of dieting (“I don’t travel, speak other languages, do crafts, or enjoy sports, but I love reading about new diets”) and how much she loves romantic comedies. Loaded with personal stories and laugh-out-loud philosophies”. In a recent interview with Movieline, Kaling revealed: “It’s very bossy. It’s basically a book of all of my bossy opinions.” Yay! This entry was posted in Rants about Books and tagged Is Everyone Hanging Out Without Me?, Mindy Kaling. Bookmark the permalink.